Ramblings of a retired couple- on the road with their 2 Bernese Mountain Dogs. Wildwood, FL was a stop very close to I-75 and truck stop. Standing outside and listening to the noise level had me convinced I’d made a disastrous mistake. But the reality was not bad at all. It’s old and the spaces are narrow and out of date, but everything worked and, since no one was given the space on either side of us, we had plenty of room. So we took advantage of the room and deployed our awning for the first time. What a comedy of errors! But we got it out and are ready to repeat the performance the next time anyone needs some entertainment. One couple thought we were locked out and trying to get into the trailer and were ready to offer some suggestions. Or maybe they thought I was trying to break in… ??? The morning after we arrived everyone was invited to a pancake breakfast. We probably wouldn’t have fixed pancakes for ourselves, but when it means not having to wash dishes (that’s my job), I’ll be there! Apparently this is a fairly common weekend thing at these campgrounds and gives people the chance to meet other campers. 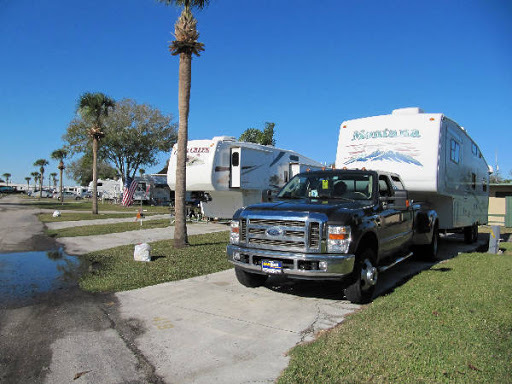 After Wildwood we were off to Lake Okeechobee KOA. 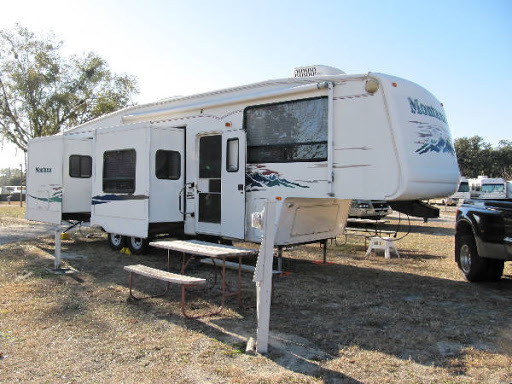 Okeechobee was our first experience with a really crowded and upscale destination resort. If, like us, you’re not a golfer, you’ll probably feel out of place! 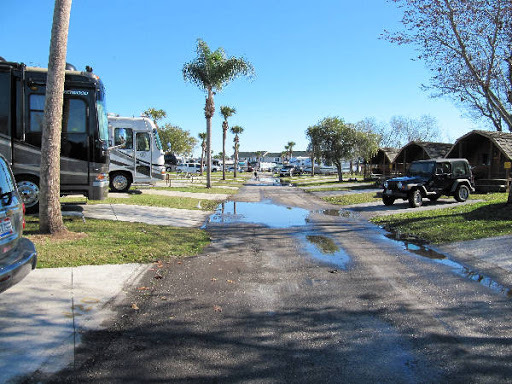 I thought the sites were really tight (I now realize I had no concept what “tight” really means in an RV resort!). But no one seems to complain since they spend most of there time on the golf course or one of the two swimming pools. And they have entertainment at their convention center, e.g. The Four Aces were on the bill. The best feature was a mini dog park where the girls could be off-leash for awhile. I think Kelly set some sort of speed record for the facility and Annie had a great time herding Kelly. It was great watching them have a really good time. So we thought “Hey, we haven’t had a Starbucks coffee for weeks… let’s go find one!” Asking around we learned Starbucks is non-existent here. What’s more we couldn’t find any place that had an espresso machine. Bummer. On the 26th we were off to the Keys. First Key Largo for the night, then on to Sugarloaf Key where we’re booked for a week. An RVer, on the road full time and wintering in Benson, AZ. This entry was posted in Uncategorized and tagged golf, KOA, Lake Okeechobee, Wildwood. Bookmark the permalink.